with Alaska's oldest and most experienced guiding company! Join Alaska Discovery on a sea kayaking, rafting, or canoeing camping adventure to Alaska's most beautiful and untrammeled wildlands. We provide everything from superb guides with intimate knowledge of Alaska, to quality equipment and expert instruction. Come alone or bring some friends. Our trips vary in length and activity levels, so anyone with an adventurous spirit can join one of our many adventures. 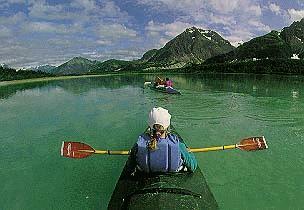 Alaska Sea Kayaking and Canoeing. Glacier Bay, Admiralty Island, Wrangell/St. Elias National Park, and more. Weave around icebergs at the base of a massive glacier, watch wildlife from the quiet seal's eye view of your boat, and camp in the verdant rainforests. Excellent wildlife photography. 1 - 8 day trips available. Arctic Rafting, Canoeing, and Hiking. Raft down the Kongakut or canoe the Noatak River, experiencing Arctic tundra, high alpine ridges, and breathtaking views in every direction. Photograph caribou, Dall sheep, and bears. These 10-day trips combine rafting or canoeing and day-hiking. The Tatshenshini/Alsek River system, flowing out of Canada and into Alaska, is North American wilderness on the grandest scale: a river six times larger than the Colorado, peaks towering three-miles high, and countless glaciers and wildlife. 10-12 day trips available. Trip lengths, departure dates, and prices. On-line Brochure Request Form and Frequently Asked Questions. Order your free full-color brochure, ask specific questions or request additional information. Our online FAQ contains answers to many questions you may have regarding our trips. Or call 1-800-586-1911.